The Attendant in Fitzrovia, London, was recently brought to my attention by the budding London coffee snob community. 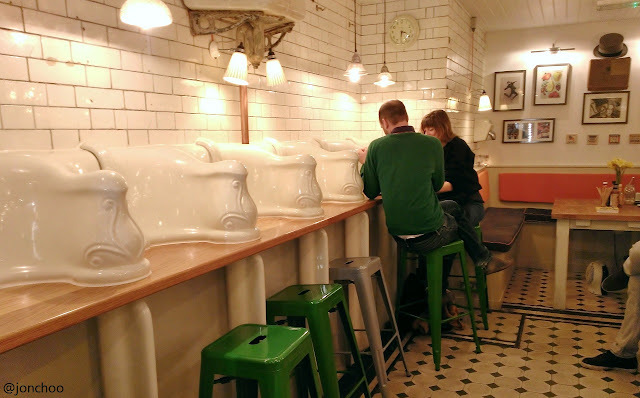 This lovely new coffee shop's rise to fame is its venue - a refurbished Victorian public toilet, built in the 1890s and closed since the 1960s. For all we know, George Bernard Shaw and George Orwell, who both lived in Fitzrovia once, probably frequented this establishment - so there's a lot history in this place. 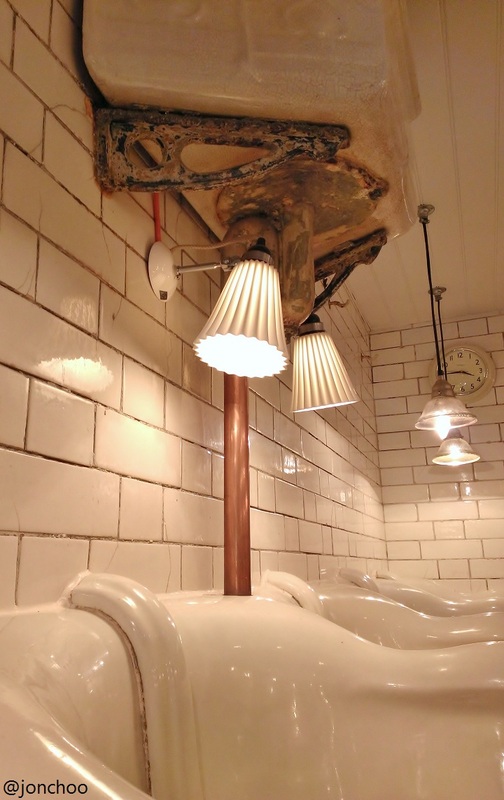 Now, the idea of turning an old Victorian loo into usable modern space isn't exactly new. Cellar Door, a cocktail bar in Aldwych is one such example. But The Attendant takes it further by retaining many of the original features. Things reserved includes the cistern towering above two Hector BTC lamps, porcelain urinals since repurposed into bar tables, where you can have your coffee at; and even the original attendant's office, which now houses a kitchen. You might be tempted to think this is all just a gimmick, and I won't blame you. Too often have we been conned by new cafes and bars who would rather trade on the the niche of their venues, rather than the value of their food or drink. However, you will be glad to know however that the same care that was put into transforming the venue has been put into their food and coffee as well. The coffee beans are sourced from Caravan, a London-based coffee roaster found at nearby King's Cross, and prepared on a La Marzocco espresso machine. The coffee are priced higher than what you would normally pay for in competing joints, but every cup served is always so well made, I ain't going to complain. The smell of fresh roast is worth the price alone. Cakes, biscuits, bagels and pastries feature on the menu, with rotating sandwiches each day. 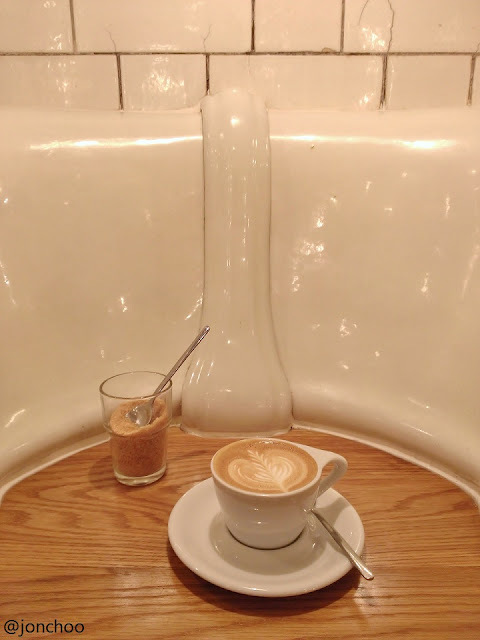 We have seen London's coffee scene evolving tremendously this past couple of years, but bar Kaffeine and Tapped & Packed, there hasn't been a huge take up in specialty coffee shops in this area of London, particularly when compared to neighbouring Soho. So it is always nice to see a new coffee shop, whose aim is to improve our caffeine palete, popping up; and in such a unique venue too. It is also refreshing to find a coffee shop with staff who can put a smile on your face. I can't remember how many coffee shops has fallen from my grace because of a scowling barista. Not here, and I hope not in the future. Mobile phone signal from both EE and Three UK appears to be able to penetrate the subterranean cafe, but free Wifi is included.